Well, I have really been sewing up a storm this holiday season. One project that I worked on was re-creating the leaf drawing that I was so frustrated with earlier in the month. While in Hawaii, I found some additional fabric at one of my favorite stores, Sew Special in Maui, to try in my background. Both the sky and the 'hilly' section are the new fabrics. In my new version, I decided to not outline the leaves but simply use Mistyfuse to bond them to a background. That worked very successfully. I then did some decorative stitching on the leaves, using my batting and fabric for the back of the piece as support. You can see that I am going for a much lighter, breezier effect this time, which I think works quite well. 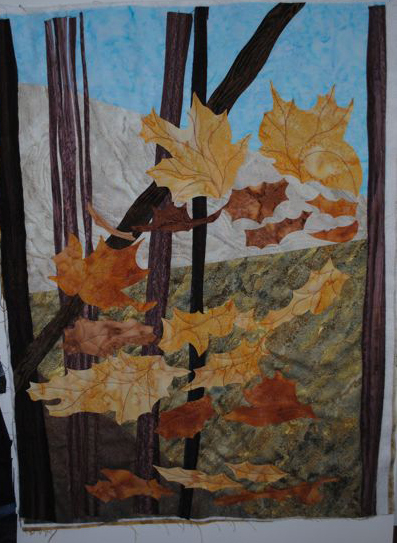 My next phase was the quilting. I decided to treat my quilting lines as wind currents. 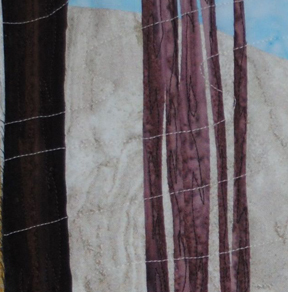 The grain in the hilly fabric actually accentuates this effect. 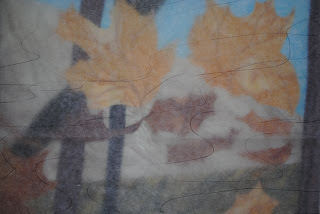 Before quilting, I actually sketched the direction of the wind through the leaves on a piece of tracing paper set on top of the fabric. I quilted some of lines through the tracing paper and then filled in more of the quilting. 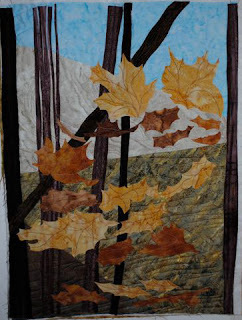 But, I didn't like my lighter quilting thread against the darker trees. So, I decided to play with the Inktense Pencils that I just got in the mail. These watersoluble ink pencils blur when water is added and fix permanently to the fabric. What I found actually worked quite well for this purpose was to wet the pencil tip and dampen the fabric. 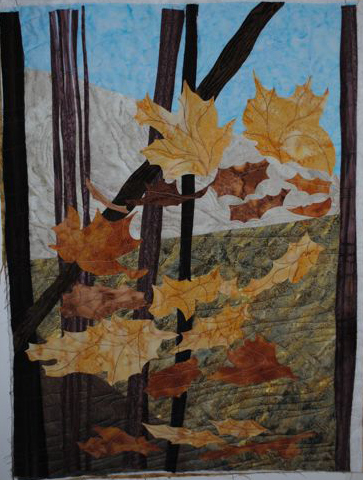 I could then easily color in the quilt thread where it crossed the trees. I am quite satisfied with the effect. The result of all this pleases quite a bit. A few more touches and I shall be done with this piece. Now you're talkin'! This is terrific, Judy! Fabulous, Judy! Happy New Year!